Harrison Ford was the god (I emphasize that with a small “g”) of eighties and nineties action movies, I think I am safe to say. I think both the studios and the filmmakers and the audiences were all for once in agreement over such a talented, attractive, box-office-breaking actor who came out of nowhere in the early seventies. Fortunately for all of us, he played cocky Bob Falfa in the George Lucas comedy American Graffiti (1973), which was able to connect him to the job of Han Solo on Lucas’s space epic, Star Wars (1977). To come to the point, one of the biggest things that makes this movie so good is Harrison Ford. Random point: he is also the master of the “aftershock handshake”, I like to call it. Watch almost any of his action films, and once a climatic scene has passed the peak and the character comes to grips with the situation, look for the hand shake he does so well. The genre of suspense is so often confused with horror. But I must clarify that I LOVE suspense movies, which in my opinion are more intense, engaging action films. And a good handful of Ford’s edge-of-your-seat flicks are included on my praised list of suspense movies (like Air Force One, Firewall, Patriot Games, Clear and Present Danger, etc). 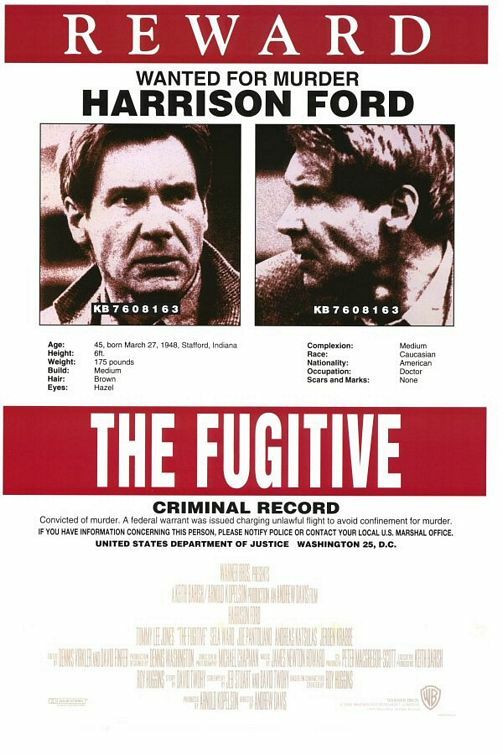 ButThe Fugitive deserves praise for a mystery/suspense/thriller that is so well executed. That’s the best word I can come up with. Executed. I personally enjoy mysteries that deal with the mystery itself from both sides of the law, and involving Tommy Lee’s character just makes things so much fun! I could spend several posts on Tommy Lee Jones alone, but I will dedicate a short paragraph to him instead. This movie is one of his best performances. He plays a dedicated, richly-defined, scene-stealing U.S. Marshall who is busy chasing Harrison Ford’s character while simultaneously barking orders at his just as amusing colleagues. Overall, a very well executed movie; a juggernaut of a ride, and full of tasteful twists and turns, and riddled with both realistic and fun characters. Highly recommended! High up on my list! The production was a circus of its own, mainly to do with the fact they started filming a high-budget action film with only a half-completed script. Throughout filming, Ford gave a heap-load of advice and suggestions as to his character’s motivations and character quirks. He also damaged several ligaments early in the production, but refused to take surgery until filming was complete, to add to his character; mainly the limp, which is distinctive throughout the film. Most of the dialogue in the movie is improvised, as requested by the director. The action film was given a healthy budget of $40 million and did surprisingly well at the box office, scoring over $360 million! It also fared well with the critics and the awards season, landing seven Academy Award nominations, including Best Picture, and winning one for Best Supporting Actor for Tommy Lee Jones; an award justly earned, I believe. I would like to end on a Tommy Lee quote in the movie (after he first begins the chase on Richard Kimble): “We’re always struck curious when we find leg cuffs with no legs in ’em.” Only a true Texan could come up with great improve dialogue like that! Notice that the poster has Ford born in INDIANA.